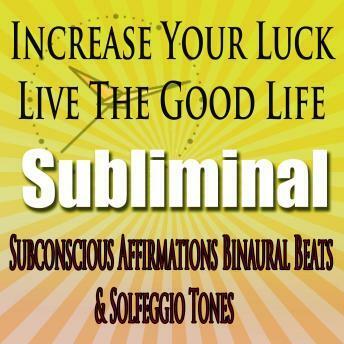 You can increase your luck and start living the good life using this easy subliminal hypnosis program. By using subliminal techniques, your subconscious mind will receive subliminal messages that will help you use the Law of Attraction to increase your luck, achieve the life you desire, and make your dreams a reality. Start living your dream life and increase your luck with this subliminal hypnosis program. It's easy! All you have to do is sit back and relax, and let your subconscious mind do all the work for you! Why wait another day? You can have better luck and live a great life!